I just got my pictures back from a trip to Virgin. 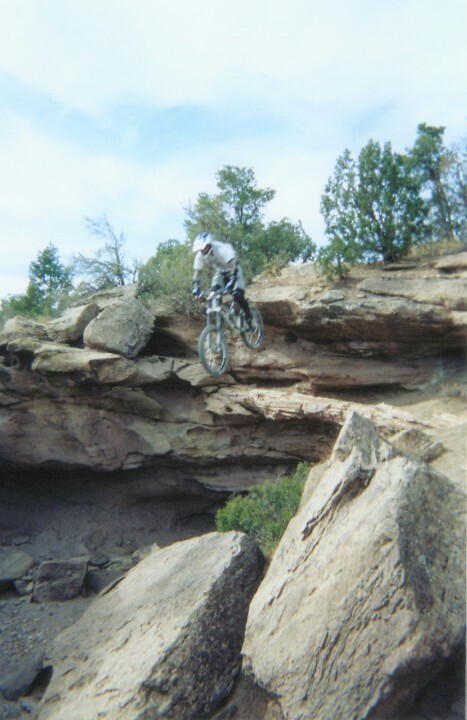 Bender took me on Flying Monkey to the King Kong line and to start, we hit a little drop called "Petrified". Notice the petrified log under the take off. Landing on the rock slab and into a flat slickrock wash. Bender was trying Chris' Canfield F1 and this was the first thing he hit! Just crazy. Damn that's sweet. Doesn't look like there's much room for error on the landing. your right. Very tight landing to a flat bottom. I was petrified to say the least. it's like the log has been waiting millions of years in isolation to be jumped by rawkus bikers. looks like chris is still rollin the steel front triangle. that bike is so nice. Actually it's a Formula 1 with a custom "Dooky Brown" powder coat and blue stickers. Kinda Wierd seeing such a big fossilized tree in the desert. awesome stuff..i wish i could ride seeing all these awesome pictures of people doin jumps makes me wanna ride and the weather is really nice right now also!! 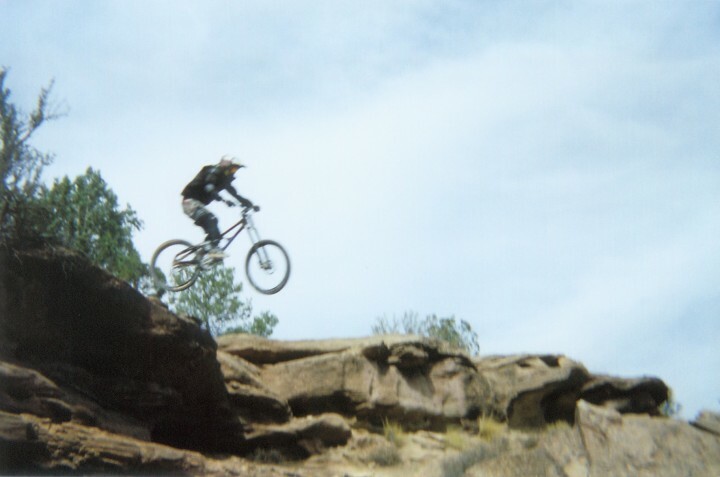 cant wait till august until i can hit up some jumps and do some races!! 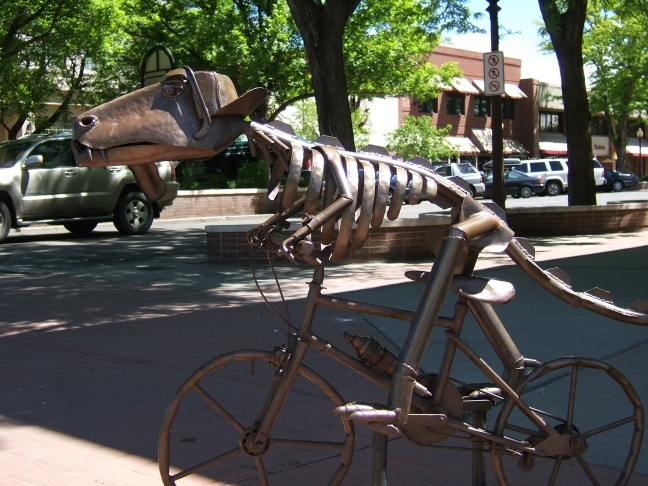 im guessing riding with bender pushed u some more than usuall or do u normall ride with him? Dude, Bender is sick. He always wear his huckin boots. I don't see how you could hit a drop like that on such a flexy bike. betta axe somebodie ... shoo, foo! I ride with Bender quite a bit. We are good friends. He is a good person to keep me pushing myself. I looked at that drop a couple years ago and thought it was too nutty but I decided that if he was willing to get it on a bike he had never ridden, I'd better sack up. "man you better get a better camera....nice pics anyway"
It's my last disposable camera that was sitting in my truck for a long while. I just bought a 6mp FijiFine pics camera. That should do the trick. Last edited by flymybike; 05-27-2005 at 07:43 AM. Zack you smart arse! Get out here and lets ride! You working this morning? We're going riding right now.... Don't ask me why I'm up before noon. Goin out to Mack, so we could swing by ifin yinz unt to. 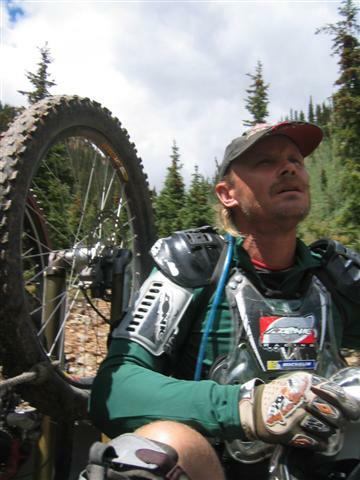 Yea I'm "working" hahah but I am taking half a day and heading to Flaming Gorge to ride. Just xc pedal fiesta to get away for a few days. Thanks for the invite though. yo zachdank whwen is that movie coming out?!?!? I've been thinkin about comin out for a film session w/ you and your bro soon. I'm headed to Reno for a film mission right now. I'll be back on sun. I'll give you a call when i get back to see if you guys are up for it in the next few weeks. by the way, i've been to that drop in the pic, and it ain't no joke. You gots to pin it or else. How do I do more than 1 quote at a time? I'm totally into that! The weekend of the 11th would be best for me, racing is starting to cut into my play time! Your right, that hit is no messing aroun, stick it or else! speaking of camera, just playing around with it and took some pics of my old helmet. The talk about "Cornfeild" in a old thread was started because Troy AKA troylet taged my helmet. Heres the pic. 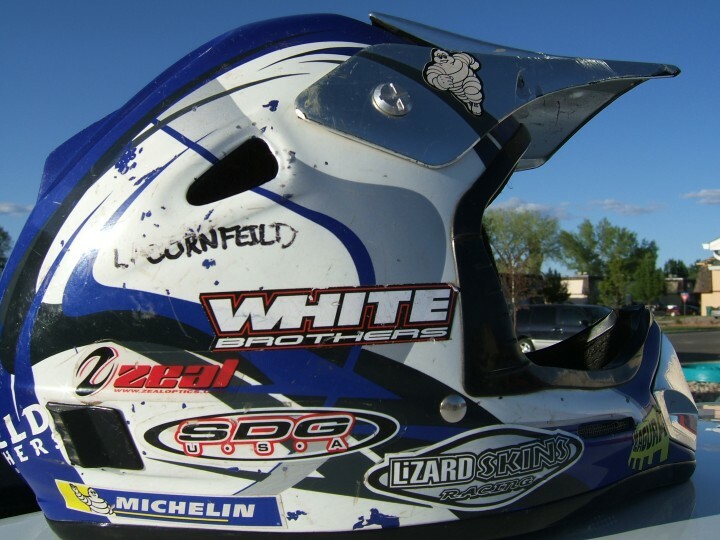 The talk about "Cornfeild" in a old thread was started because Troy AKA troylet taged my helmet.